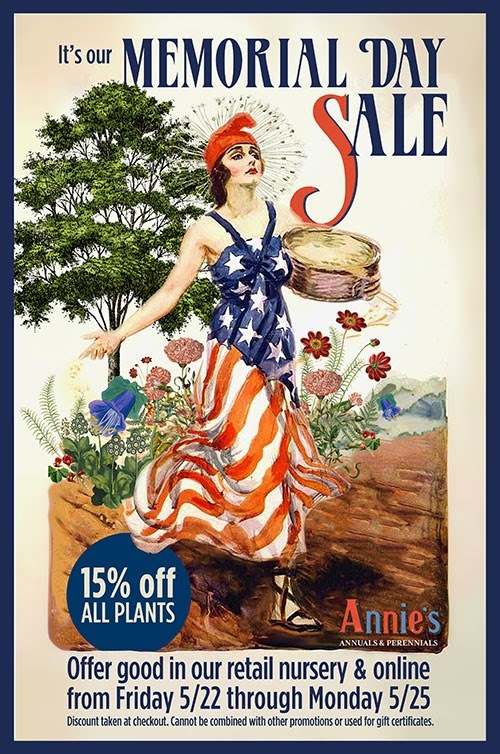 Annie's Annuals and Perennials is having a Memorial Day weekend sale starting today. I've bought quite a few plants from her and am extremely happy with Annie's service and quality of plants. Here's a vendors list of milkweeds thoughtfully supplied by Monarch Watch.org. BTW: the Container Butterfly Garden is listed as a registered Monarch Waystation! So is the Alta Laguna Park Butterfly Garden, but that is a different story... Unfortunately, the site is temporarily down for maintenance at the moment. 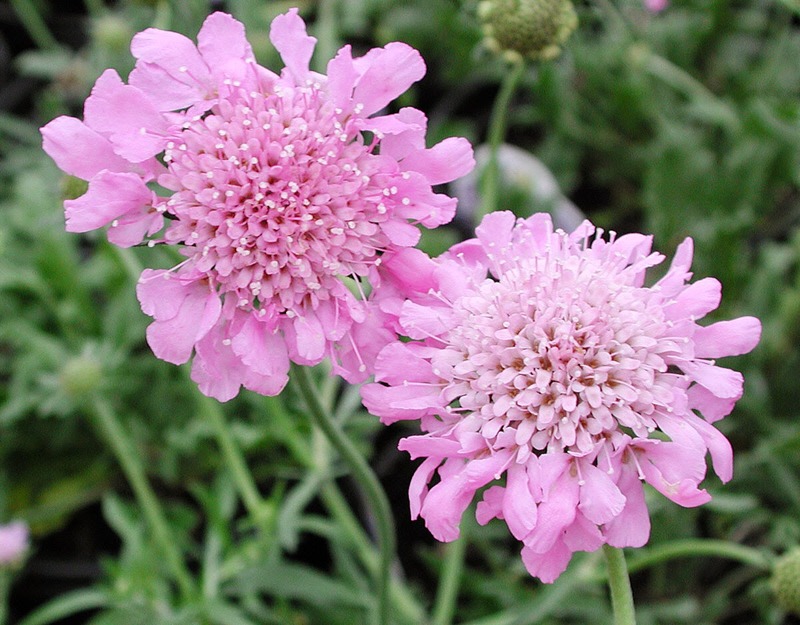 Ahhhhhh... the Scabiosas, or pincushion flowers. I've come to love these Grand Masters of nectar producing, dainty dandy darlings of the garden. 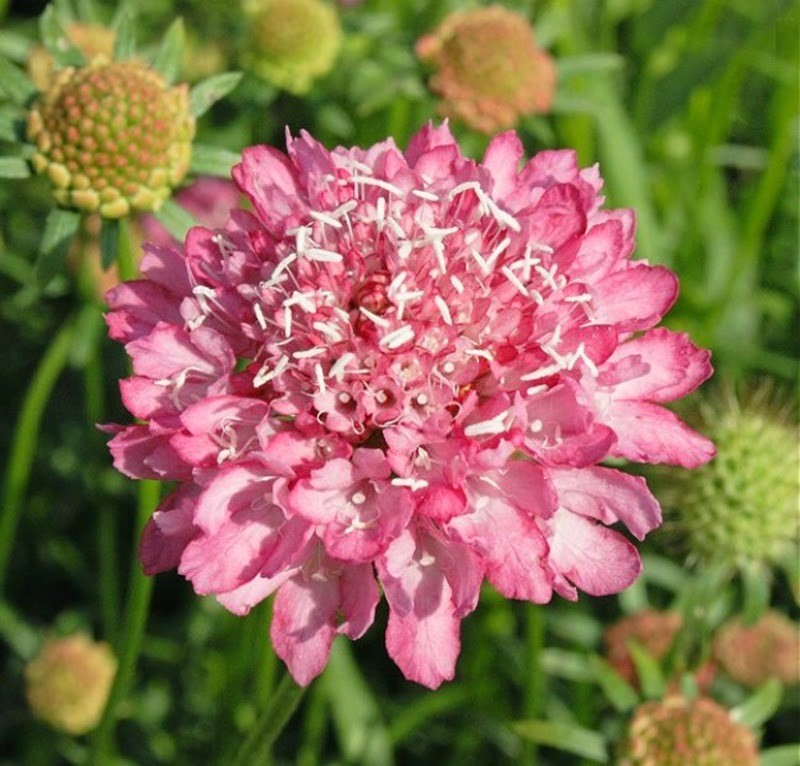 Right now, the Container Butterfly Garden is home to two species and three varieties. A surefire addition to a butterfly garden, there's always room to be found for at least one somewhere in a sunny little pocket or in a nice little pot. Colors range from white to yellowish, pinks and reds, into blues; blue hues being the most prevalent. Somewhat variable in flower shape and growth habit, they do adhere to a basic form factor; the various species, crosses, and varieties are readily identified as belonging to the same close knit family. All excel at enticing butterflies into the yard, coaxing them to explore and linger. 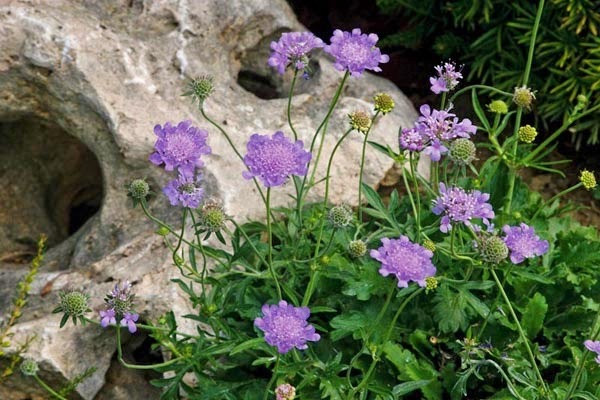 Some of the smaller varieties can be used as a perennial border plant and feel right at home in a rock garden or alpine setting; all do well in containers. 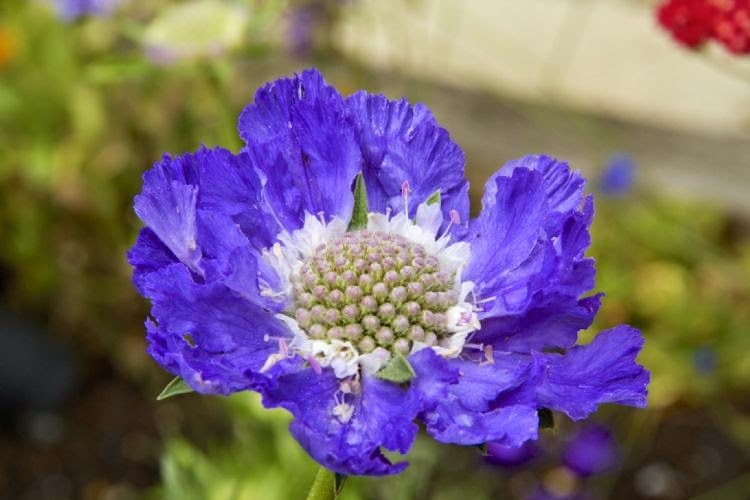 'Butterfly Blue' is the daintiest of the pincushion flowers in the container garden. 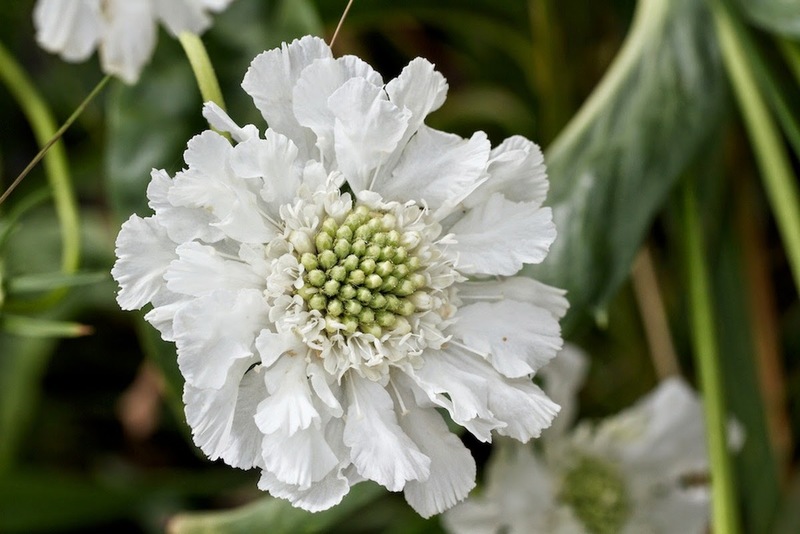 A constant bloomer, these plants offer up flowers almost all year round. The only months I don't see flowers is January and February. 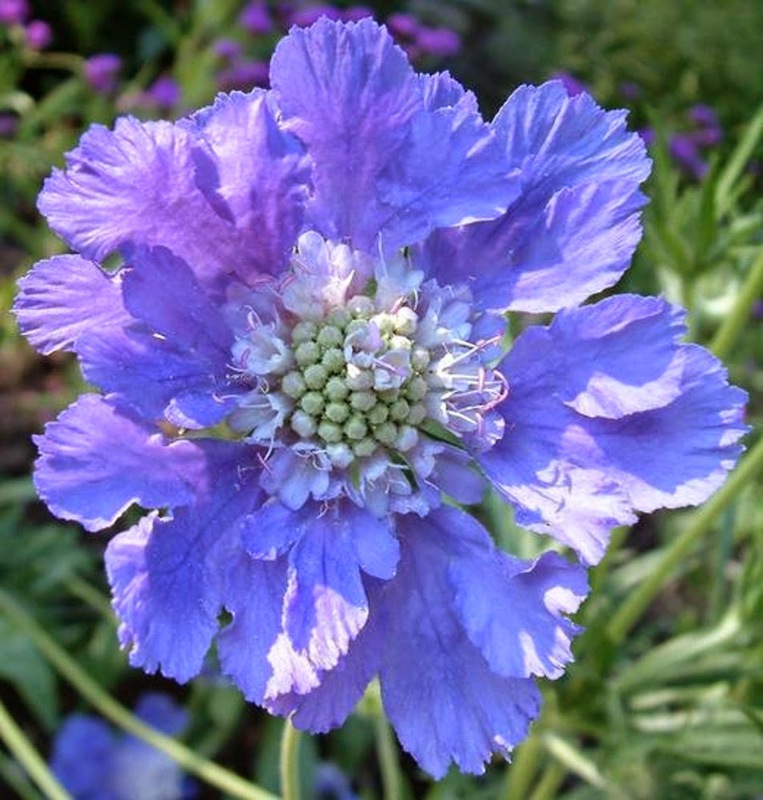 A prolific bloomer, 'Butterfly Blue' is guaranteed to festoon itself continuously with bluish lavender colored blooms. Seed heads are sterile. 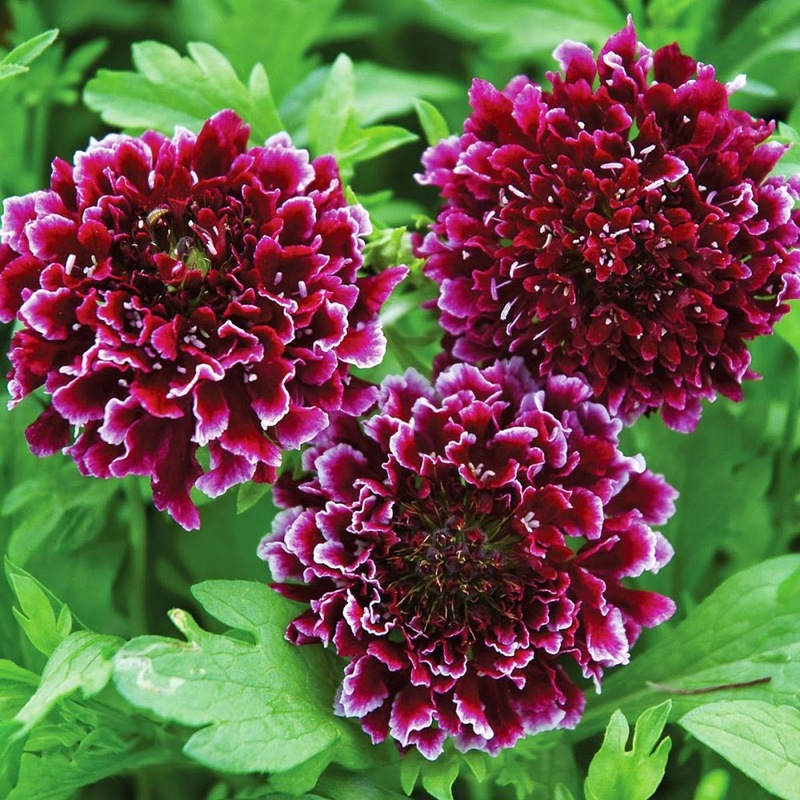 Divide crown every three years if one wishes to propagate more plants for the garden. I found 'Mariposa Blue' when scouring around a local independent nursery close by and instantly became enamored by its vigorous good looks. 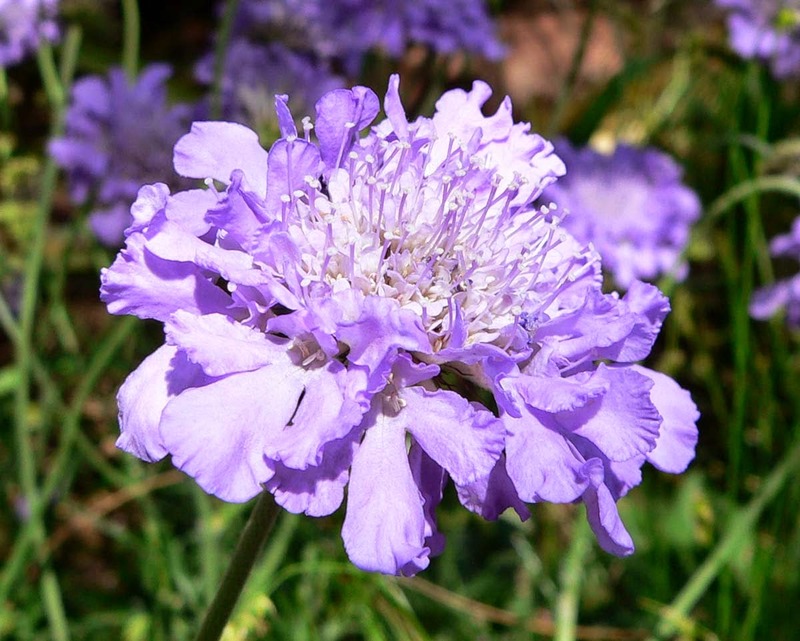 The flowers are a bit larger, though fewer than 'Butterfly Blue' and are of a deeper color. 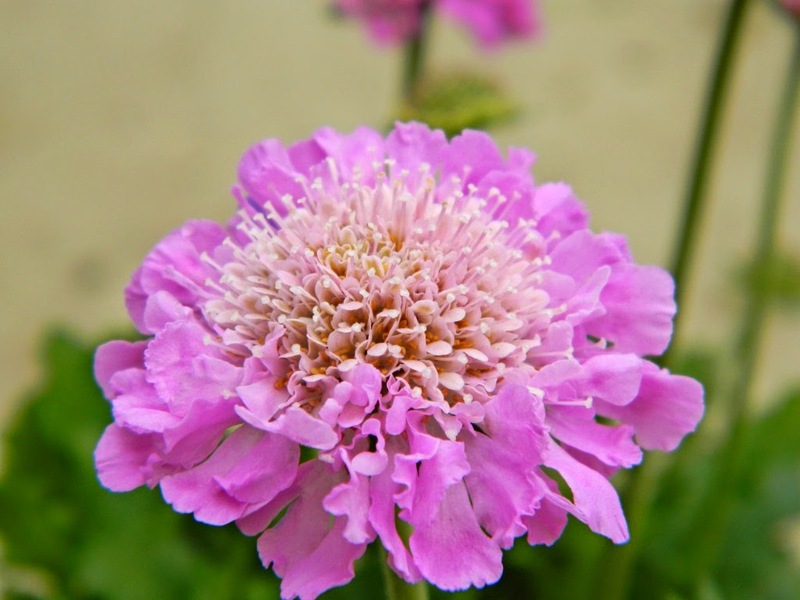 The plant itself is a bit beefier and more compact looking than 'Butterfly Blue'. It doesn't flower as long a season, the first buds arriving in late March to early April here. My impression is that 'Mariposa Blue' is stronger and hardier than 'Butterfly Blue', being less prone to powdery mildew than its sibling. I had one of each overwintering side-by-side in the garden that became quite shady as the winter sun dropped lower in the sky. 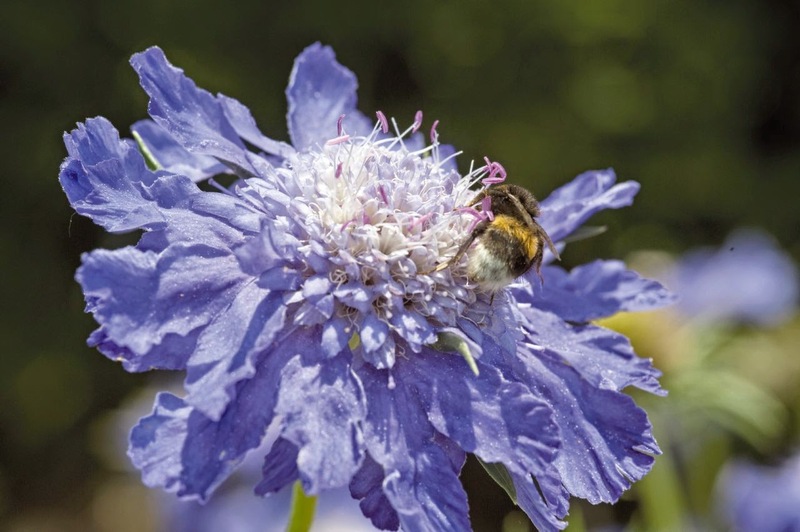 'Butterfly Blue' developed powdery mildew, whereas 'Mariposa Blue' remained pest free. I placed each plant in a sunnier spot, whereupon the mildew eventually vanished after several months. 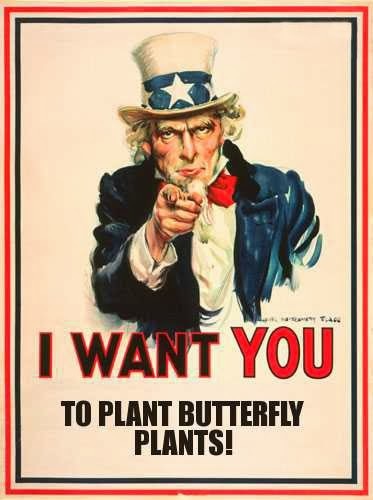 Since the Container Butterfly Garden only experiences a couple of carefully picked and applied chemical pesticides, no fungicide was applied to the affected plant. I do use Roundup sparingly in the never ending battle against weeds, as my back and knees literally don't bend to my will as they did in days of yore. The other pest potion used very sparingly in the garden is insecticidal soap, an environmentally safe alternative to harsher chemical sprays. I use Safers brand, but if one is industrious, there are online recipes for homemade brews. I only use the soap early in the season when soft bodied Oleander aphids first appear and minimal numbers of caterpillars are present. A direct spray effectively dispatches them. If a cat did come to eat some of the sprayed plant, it may suffer a bad case of indigestion, but wouldn't necessarily die. Insecticidal soaps are contact sprays, not systemic, or internal sprays. I don't even attempt to spray Large Milkweed bugs; they are fast, and carpet bombing with harsher chemicals is about the only solution. I have my doubts that soaps would even work on them, for their bodies may not be quite as soft as aphid bodies. I've sprayed them before with Safer's, only to have them drop and hide out of sight. Does it kill them? Don't know; they freak and skedaddle off out of sight so fast. For bugs, I use a jar half filled with water and a few drops of Dawn dish detergent added to make the water "wetter", allowing the water to drown these pests faster and more humanely. 'Fama Blue' is stunning in bloom. Unfortunately, it's not a prolific bloomer as the two previous Scabiosas mentioned. Oh well, the brevity of bloom makes one appreciate it even more. It's big, it's bold; you know when 'Fama Blue' is around. And the color is to die for! 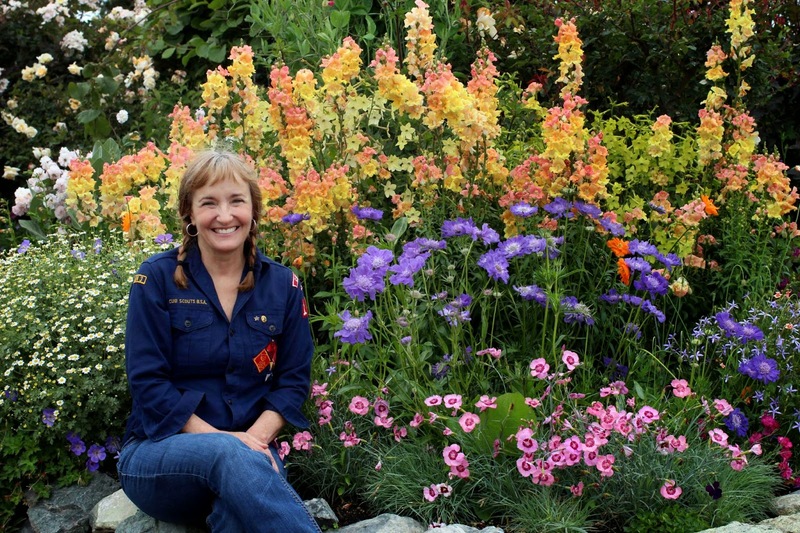 Annie from Annie's Annuals and Perennials sits beside her plot of flowers, with 'Fama Blue' nestled in the middle. The container garden is home to several of her online offerings. Annie's plants always arrive healthy, full, securely packed, and are guaranteed fresh or your money back. Ships from the Frisco Bay area. Non demanding plants, scabiosas like full sun to part shade, but be careful in shadier environments, as they tend to develop powdery mildew. This will rectify itself once they are brought back into a sunnier spot in the garden. Give afternoon shade in hotter, interior regions. Those that originate from Mediterranean climes are more water thrifty than ones from wetter, cooler places. All can get by with average watering schedules. 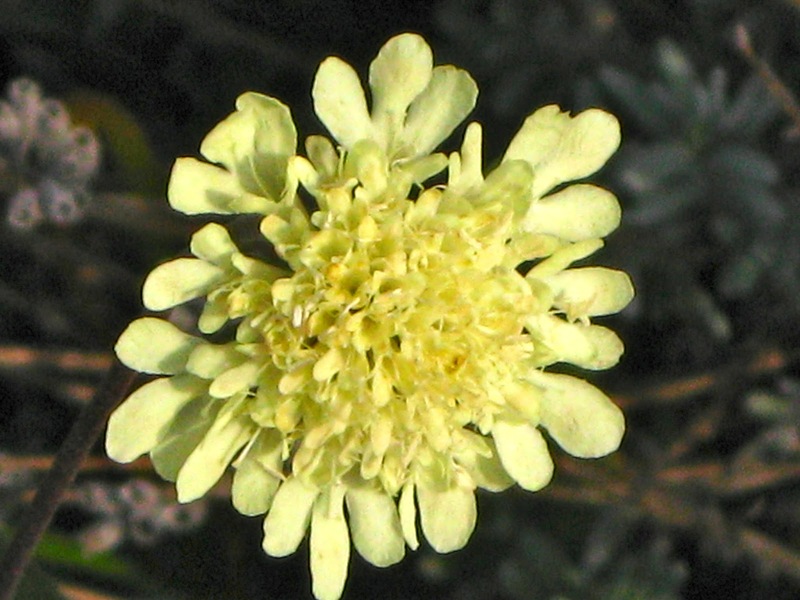 Scabiosas aren't necessarily hungry plants, but will bloom more profusely with a monthly feeding during blooming season.